By Tammy Todd ttodd4jesus is on the cover of this cookbook. The recipe is sure to be a winner with many cooks out there,it is pretty and best of all a healthy salad. I love salads of all kinds and thank every just a pinch cook for their wonderful recipes that is in this book. There are so many choices and best of all, every single recipe is delicious! Hi Cassie-Thanks,I love salads so much and I needed more ideas than what my own cookbooks have. Glad you like the cookbook,again,I am just having a blast creating them. I have enjoyed many other cookbooks on this site too,really alot of good recipes out there to try. Hi Tammy Todd-I am so happy you got so excited and you should be,this recipe is a winner and I will be making this one alot,living in Az you know how it gets rather warm here fast,I need recipes that are delicious,simple and healthy and that does not heat up my kitchen and yours is perfect! I think it looks beautiful on the cover. Hello Dale Stanley- You are so welcome,your recipe is a winner and I can't wait to make it,looks delicious! @emh52, thanks for including my bleu cheese and bacon coleslaw recipe! Hi Tammy Todd-I bet you got so excited huh? It was a honor to use your recipe in my book and on the cover. I think its a winner and I added it to the cover because it looks so delicious but also so pretty. I hope you enjoy the cookbook and I have seen the ones you created too, wonderful job on all of them! Hugs. Hello Cindi B-Your so welcome,I was glad to add your recipes! I am following you too, you have awesome recipes! I can't wait to make many of them. Glad you like the cookbook! Hugs. Hello Millie Johnson- Im so glad you will be enjoying the cookbook. Thank you for your kind comment too. 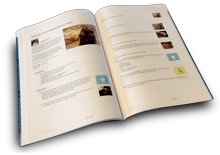 It was a pleasure to add your recipe to the book, your recipe will be enjoyed by many! Hugs. Eileen, I'd like to also thank you for including two recipes which I've posted on JAP... Macaroni Salad (Paula Deen's), and Watermelon and Seedless Cucumber Salad. Nice cookbook by the way! Thank you for including my grilled tomato salad in your cookbook. Great idea for one, btw ! This will be my go to salad cookbook. Great job !